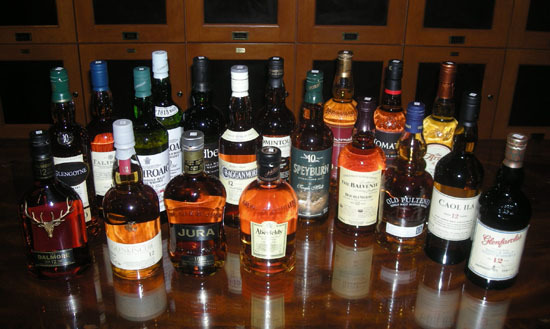 At Cigar Inn in NYC, 26 journalists, retailers and aficionados tasted 19 single malt scotch whiskies, aged 10-12 years. Strict tasting rules were implemented. The products were served "blindly", without distractions of brand names. The order of service was established beforehand by lottery. Each of the scotches were poured into fresh glasses from new sealed bottles, and immediately served at room temperature. Ice water and bar mix was available to cleanse the palate. 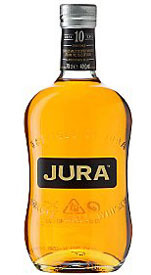 Tasters were encouraged to add a few drops of water to the scotch, if desired. The judges wrote down their impressions of each product on score sheets. The scoring was done on a 5-point system, with 5 as the best. Double-Gold, Gold and Silver medals are awarded based on a set range of final point scores received from the judges. The tasting notes are summaries of the judges’ opinions. Prices quoted are for 750ml sizes, and may vary by state. Nose: Floral elements, hint of pineapple, easy vanilla, fruity, wood. Palate: Controlled wood, cedar, creamy, orange peel, dark fruit, dried fruit, citrus, hint of vanilla, toffee, cinnamon, cloves, some spice, hot orange, smoked pepper, floral, sherry, rich mouthfeel, well-balanced, very smooth, refined, easy to drink, very nice, excellent. Finish: Clean, smooth, dried fruit, oaky almond, creamy, sherry, spicy, lingering. Nose: Peat, oak, nuts, orange. Palate: Caramel, vanilla, dried fruit, pear, off-lemon, cashews, toast, peaty, smoky, charcoal, woody, oak, leather, hint of sweetness, spicy, pepper, nice. Finish: Smooth, pepper, buttery, light treacle, smoky, nice, kind, even, long. Nose: Medium oak, citrus, caramel, light charred wood, dried berries, orange, earthy. Palate: Rich, caramel, trace of oak, sherry, vanilla, almond, Fourth of July pepper, tangerine, fruity, floral character, creamy, honey sweetness, hint of cinnamon, leathery, salty, slightly smoky, smooth, well-balanced, classic. Finish: Coffee, ginger, smooth, short, great, long. Nose: Spicy, dried fruit, cherry. Palate: Caramel, vanilla, creamy, butter, toffee, almond, orange, sweet, some spice, herbs, woody, oak, smooth, beautiful, exceptional. Finish: Great, brilliant, balanced. Nose: Smoke, spearmint, caramel, butterscotch, bourbon, orange peel, spice, nutty, floral. Palate: Peaty, dark wood, coal, ash, woody, honey, cherry, spicy vanilla, dried fruit, ginger notes, peppermint, cinnamon, some spice, nutty, oily, full bodied, cask strength, tangy, chewy mouthfeel, opens with water, well rounded, smooth, aged, mellow. Finish: Strong, spicy, nice, long. Nose: Citrus into orange, butterscotch, honey, caramel, spice, pepper. Palate: Sweet, spicy, subtle, savory, sherry, molasses, brown sugar, burnt honey, caramel, toffee, oaky, nutty, salty, caraway, clove, orange peel, dark fruits, rustic, musky, oily, medicinal. Finish: Chocolate cake, salty, spicy, rum cask, nice, even, smooth, balanced. Nose: Light smoke, citrus, honey. Palate: Peppery, spicy, oak, smoky almond, salty, hint of peat, malty, herbaceous, grassy, floral, cereal, clove, ginger, dried fruit, honey, caramel, treacle, toffee, raisin, lemon, citrus, sweet, oily, silky, smooth, elegant mouthfeel, well balanced. Finish: Nice, with honey and dark fruits. Nose: Light, vanilla, fruity, caramel. Palate: Peaty, nutty, baked cloves, rich layers, some spice, nutmeg, acorn, honey, vanilla, caramel, sweet to semi-sweet, fruity, orange notes, citrus oil, oak, light cedar, oily, light on smoke, well-balanced, very good, very smooth, excellent. Light bodied. Finish: Woody, nutty, toffee, pepper, medium. Nose: Orange, caramel, oak. Palate: Peaty, chocolate, charcoal, caramel, vanilla, smoke, smoky oak with spice, woody, leather, salty, bacon, dark roasted coffee bean, cereal, malty, hints of berries, dark fruits, apricot, orange peel, smooth, medium bodied, interesting. Finish: Spicy, pure, velvety, medium-to-long. Nose: Vanilla, orange, citrus, almond, creamy, malty. Palate: Woody, peppery, smoky, creamy, vanilla, butterscotch, caramel, hint of toffee, orange peel, dried fruit, cinnamon, apples, fruity, almond cedar, sweet, spicy, salty, floral, mossy, tannic, smooth, delicious. Light bodied. Mild heat. Finish: Even with leather, toffee, notes of citrus and some spice. Nose: Smoke, spearmint, caramel, butterscotch, bourbon, orange peel, spice, nutty, floral. Palate: Fruity, tannic, spiced, husky melon into chocolate, right amount of peat, hint of smoke, woody, nutty, toffee, caramel, dark fruits, citrus, floral notes, creamy, light, smooth, pleasant. Light bodied. Finish: Lovely almond, ginger, vanilla. Nose: Mild, robust, orange peel, brown sugar, butterscotch. Palate: Caramel, citrus, mandarin orange, orange, dried fruit, nuts, almond, peppermint, creamy, buttery, vanilla, honey, sweet, salty, spice, some smoke, woody, touch of peat, balanced, smooth, elegant, classic. Finish: Soft, long, complex, spicy, nutty. Nose: Sweet, toasty oats, caramel, almond, woody, moss, peaty. Palate: Peaty, smoky, sweet, mild spice, smooth, creamy body, citrus tones, honey, vanilla, butter, pepper, leather, charcoal, medicinal, cedar, light bodied, balanced, water releases floral notes, toasty notes and wood (oak) on back of palate. Finish: Complex, sweet, lingering, with a hint of cloves. Nose: Peaty, floral, vanilla, brandied cherries. Palate: Citrus, lemon/orange, creamy, vanilla, caramel, burnt sugar, toffee, coffee beans, fruity, almond, ginger, sweet, rich, spicy, pepper, tannic, peaty, oak, cedar, medium smoke, hint of sherry, medicinal, smooth. Finish: Great, smooth, coffee, toffee, pleasant bite. Nose: Rich, light oak, fruity, citrus, vague vanilla, caramel, raisin. Palate: Caramel, vanilla, light smoke, tanic, slight oak, cereal, toasty, toffee, dried fruit, cinnamon, mild citrus, floral, fruity, sherry, sweet, spicy, pepper, musky, oily. Full mouthfeel. Medium bodied. Finish: Smooth, slightly spicy, peppery, coffee, lingering. Nose: Lemon, cedar, lightly sweet, fruity, flowery, rosebuds. Palate: Smoky, woody character, toffee, vanilla, butter, caramel, clove, almond, coconut, tropical notes, raisins, ginger, floral, sweet, nutty, oak, hints of pepper, some spice, sherry, creamy, smooth. Finish: Nice, smooth, light pepper, hint of lime, strong. Nose: Herbal, vegetal, floral, light oak, cedar, butter, vanilla, cinnamon. Palate: Herbal, vegetal, floral, heather, oak, butter, vanilla, caramel, orange, mango, citrus fruit, tropical fruit, fruity, raisin, light chocolate, sweet, surprising pepper, slightly peaty, leather, smoke, oily. Finish: Long, spicy, malt, hot, nice bite. Nose: Salty, maritime, light citrus, burnt caramel, lightly floral. Palate: Strong pepper start, herbaceous, grassy, floral, woody, oak heat, cereal, toast, saltines, dark chocolate, vanilla, sweet, spicy, smoky, musty, tangy. Finish: Complex, sweet, oak, espresso, strong, harsh, short. Nose: Smoky, peaty, butter, vanilla, citrus. Palate: Heavy peat, toasty, bread, mild smoke, cedar, iodine, oaky, peppery, fruity, nutty, salty, briny, oily, charcoal, citrus, tropical flowers, tulip, honey, toffee, vanilla, mediocre, disappointing. Finish: Weak, smooth, creamy, smoky, ashy, rough.